The new book from astronaut Tim Peake, the number one bestselling author of Hello, is this planet Earth? How does it feel to orbit the earth ten times faster than a speeding bullet? What's it like to eat, sleep and go to the toilet in space? And where to next - the Moon, Mars or beyond? 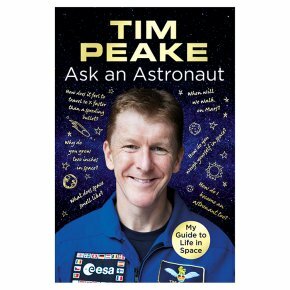 Ask an Astronaut is Tim's personal guide to life in space, based on his historic Principia mission, and the thousands of questions he has been asked since his return to Earth. Accessible, in-depth, and written with his characteristic warmth, Tim shares his thoughts on every aspect of his mission. From training to launch, from his historic spacewalk to re-entry, he reveals for readers of all ages the cutting-edge science behind his ground-breaking experiments, and the wonders of day-to-day life on board the International Space Station. The public were invited to submit questions using the hashtag #askanastronaut, and a selection are answered by Tim in the book, which will be accompanied with illustrations, diagrams and never-before-seen photos. Tim is pleased to announce that, as with his previous book, royalties received from the book will be donated to The Prince's Trust.